The AVERAGE, MAX (for maximum), and MIN (for minimum) functions in Excel 2016 are the most commonly used of the statistical functions because they are of use to both the average number cruncher as well as the dedicated statistician. All three functions follow the same syntax as the good old SUM function. Just as in the SUM function, the number arguments are between 1 and 30 numeric arguments for which you want the average. The figure illustrates how you can use the AVERAGE, MAX, MIN, and MEDIAN functions in a worksheet. 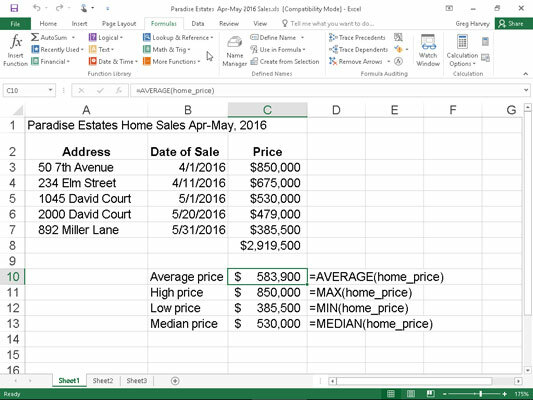 This example uses these functions to compute a few statistics on the selling prices of homes in a particular neighborhood. These statistics include the average, highest, lowest, and median selling price for the homes sold in April and May 2016. All the statistical functions in this worksheet use the same number argument; that is, the cell range named home_price in C3:C7. Home sales spreadsheet using common statistical functions. Note that this formula uses the SUM function to total the values and another statistical function called COUNT to determine the number of values in the list. The MAX and MIN functions simply compute the highest and lowest values in the cell range used as the number argument. The MEDIAN function computes the value that is in the middle of the range of values; that is, the one where half the values are greater and half are less. This is the reason that the median sales price (in cell C13) differs from the average sales price (in cell C10) in this worksheet.